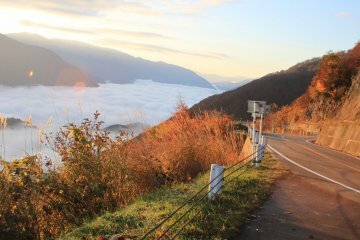 The sun had long gone down, the steep mountains surrounding the inky river only heightened the blackness. 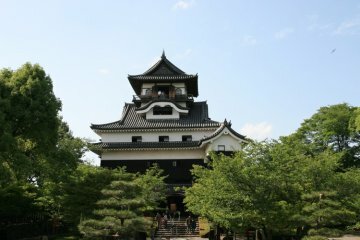 On one of the hilltops overlooking the wide, lazy river was a castle. Below it long, narrow boats made their way from upstream towards the fortress. 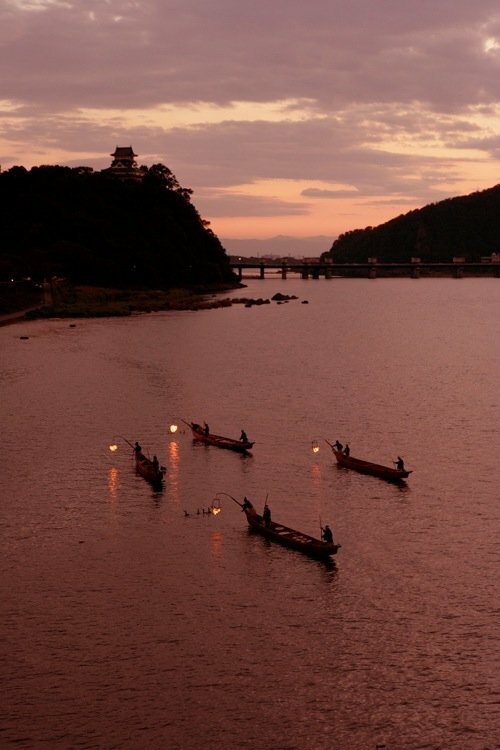 Surely those in the castle could see the large steel baskets of fire hanging from the front of the boats? 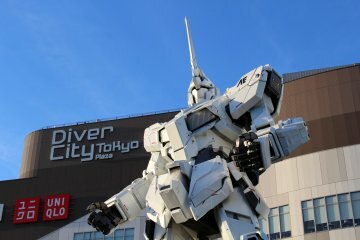 Indeed they could, and they were no doubt enjoying the spectacle! 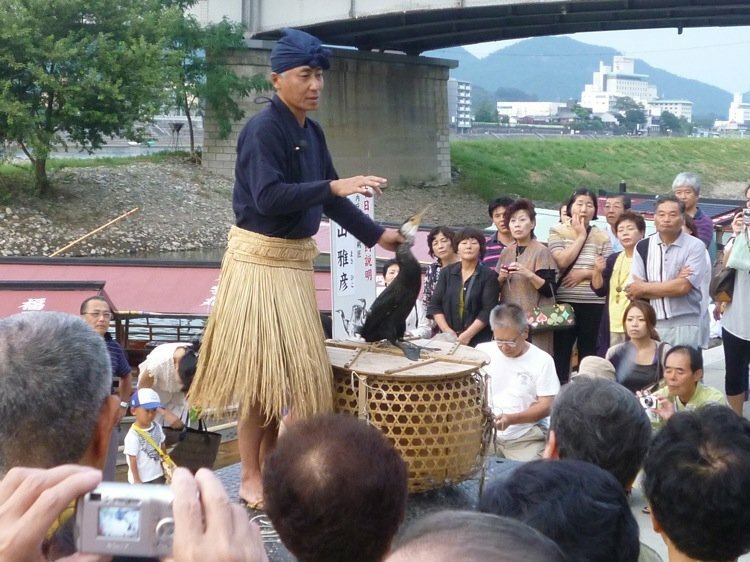 For over 1300 years, the traditional art of Ukai, or cormorant fishing, has been practiced on the rivers of Japan. 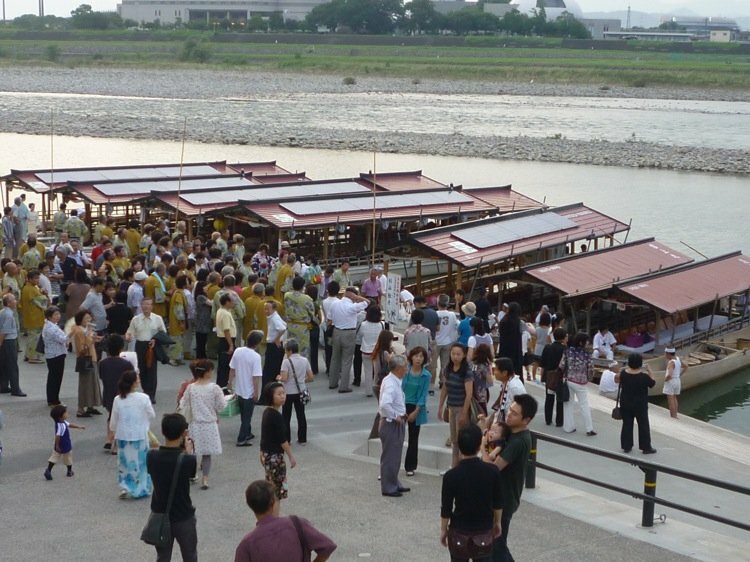 Today the practice can only be seen in 5 places across the nation, and one of the better known is on the Kiso River, just upstream from the National Treasure listed Inuyama Castle in Aichi Prefecture, about 30 minutes north of Nagoya City. 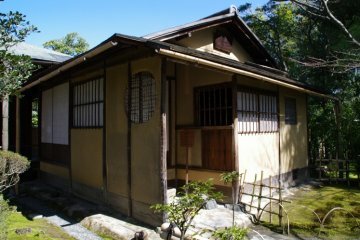 Watching Ukai was a popular pastime amongst feudal lords and the rich from the 8th to the 19th Centuries. The practice later gained special support from the Emperor. 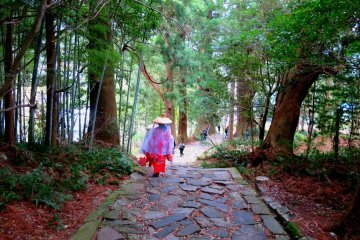 These days there are very few people authorized to perform the traditional fishing practice, and the rarer the art becomes, the more popular it has become amongst tourists. Laying claim to have seen Ukai puts one in a class of their own amongst the Japanese, who look with envy and awe at anyone having enjoyed the ancient discipline. 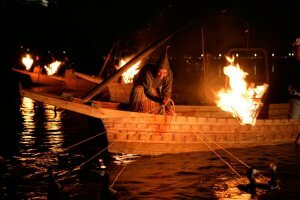 Ukai is performed at night from 13 meter long flat bottomed wooden boats called “Ubune” with fires burning at their bow. 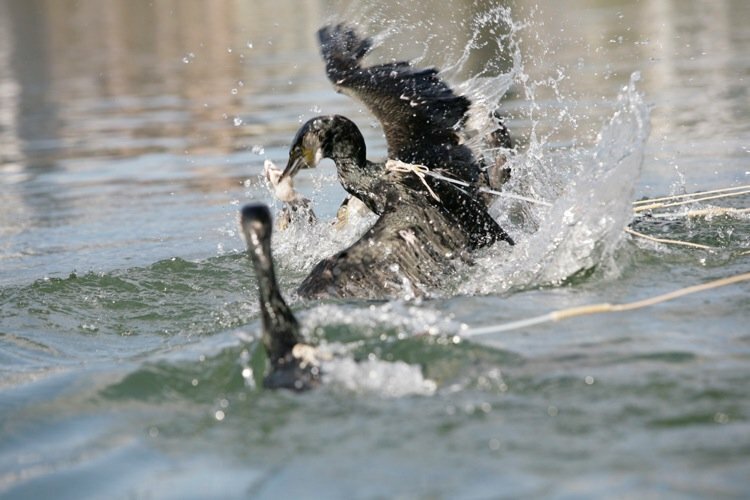 Two crew man the rudder, navigate the shallower waters and collect the fish, while the leader handles the cormorants. 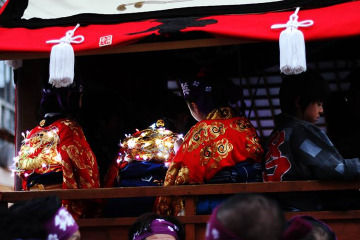 The lead fisherman, or Usho, is a hereditary position and comes under the control of the Imperial Household Agency. 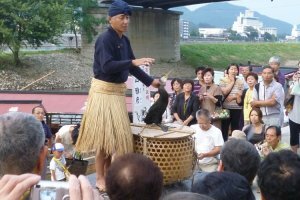 Dressed in the traditional garb of their ancestors, a water repelling straw skirt over a dark cotton kimono and pixie like cloth cap, the Usho handles ten cormorants tethered at the neck with straw ropes. 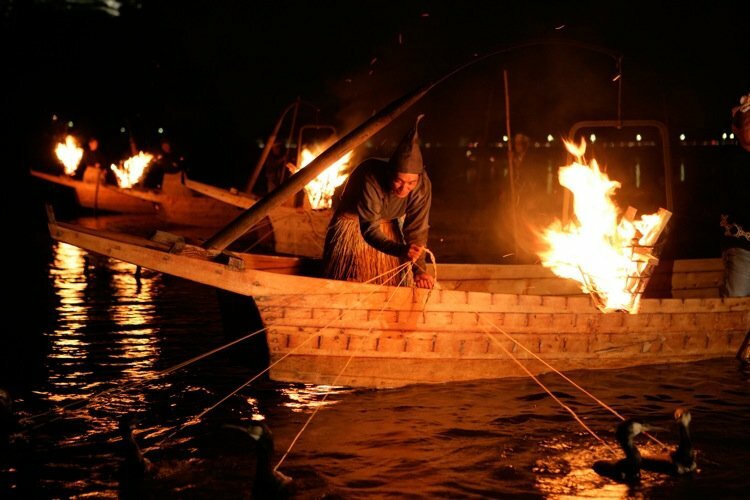 The fires burning in the steel mesh baskets suspended over the water from the front of the boats attract the Ayu sweetfish, which are caught by the diving cormorants. Before the birds can swallow the fish however, they are pulled to the surface and the fish disgorged into the boat. 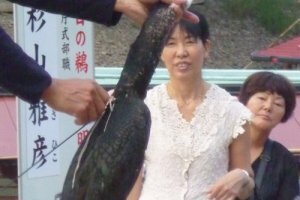 Metal rings around the birds’ necks prevent the larger fish, (ie, those desired by tourists, local restaurants and the Royal Family) from being devoured. 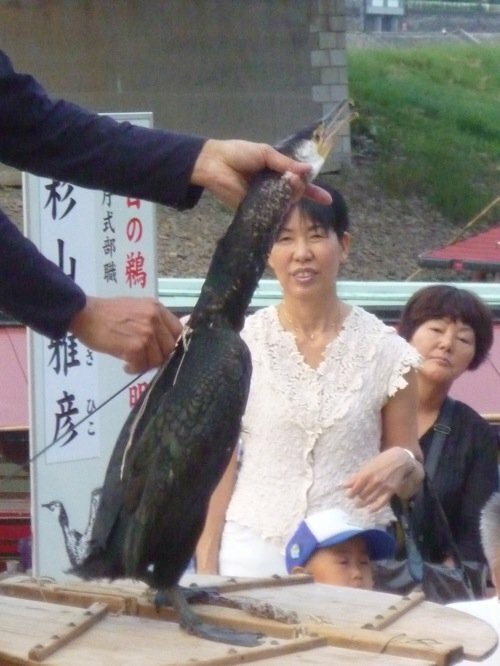 Despite claims of animal cruelty, the Usho treat the birds as one of the family. Often the birds live with the traditional fishermen in their houses! The life span of a wild cormorant is said to be about five years, while the well cared for Ukai cormorants have a lifespan of 15 to 20 years. 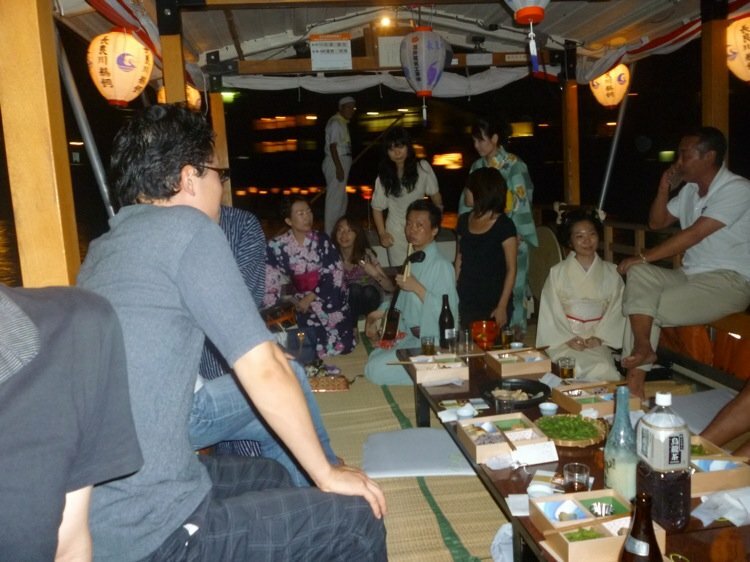 Ukai remains a popular preserved traditionThe Ukai fishing season operates during the warmer months from June to the end of September, except for nights of full moon and when the river rises above a certain height. 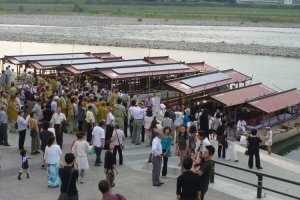 Guided boat tours are available for as little as 3000 yen, ranging up to 50,000 Yen plus, for more extravagant affairs, private boats complete with box dinners, geisha or maiko and entertainments. 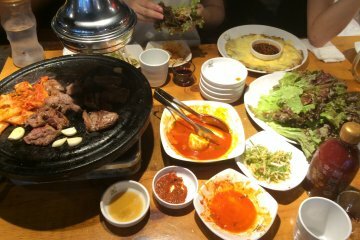 Either way, reservations are required. 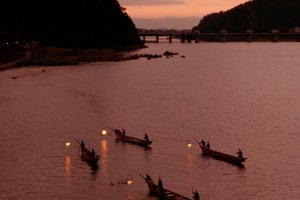 Escape the heat of the Japanese summer and enjoy a night on the Kiso River watching one of the oldest and most traditional of Japanese events, Ukai, cormorant fishing, the summer sport of the Lords of Japan. 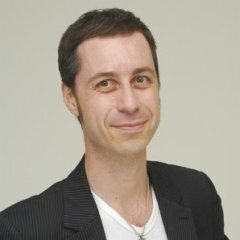 Chris , I love this article, it brought back many happy memories! !